During the usual overnight fast the body’s metabolism naturally switches into ketosis, and will switch back to glycolysis after a carbohydrate-rich meal. Longer-term ketosis may result from fasting or staying on a low-carbohydrate diet, and deliberately induced ketosis serves as a medical intervention for intractable epilepsy. 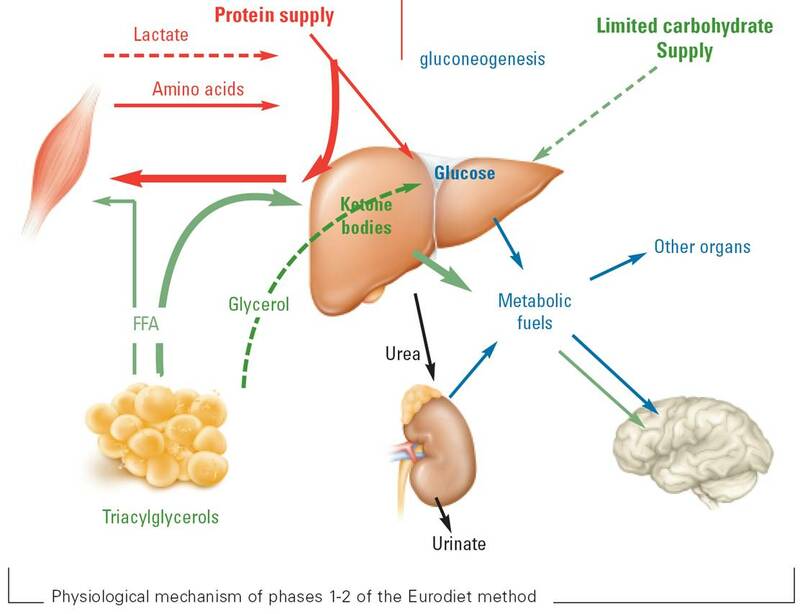 In glycolysis higher levels of insulin promote storage of body fat and block release of fat from adipose tissues, while in ketosis fat reserves are readily released and consumed. For this reason ketosis is sometimes referred to as the body’s “fat burning” mode. For some people it doesn’t work this way all of the time. Their body chemistry is slightly different and when they eat a meal that includes carbohydrate their insulin response is higher, their pancreas secretes more than required to deal with the carbs (glucose and fructose) that result from eating. Their muscles don’t respond to the signal to accept glucose for energy as quickly as their adipose tissues do to the signal to begin storing glucose as fat. Their blood sugar stays high, their insulin level never quite drops off, they don’t go into ketosis at night. More of their food energy goes into storage sooner, so they get hungry more often, sometimes even in the middle of the night. They gain weight instead of staying at the same weight. Gaining weight in this way has nothing to do with how much you eat or how hard you work, its just basic biochemistry. I am at the time in my life where if I eat carbs I will ever so slowly gain weight. I am working no harder or easier than I ever have, nothing has changed in the kinds of foods I eat. If I eat carbs I ever so slowly gain weight. I know what to do about it though. I need to put myself in ketosis intentionally, and all day long. The road to ketosis starts at breakfast. Two eggs and a slice of fatty ham are my normal faire. Lunch is a half pound of breakfast sausage, the fatter the better. Dinner is a twelve ounce ribeye steak with a red wine reduction sauce on it. No vegetables, no starches, no sweet drinks are invited to the party. After three days of this I am in ketosis and I know this by using “Ketostix” from Bayer, that I found in the diabetic section of the drug store. It takes three days of no carbs to really see a response in the Ketostix. In ketosis life is only a little bit different. I don’t really get hungry. I don’t ever experience flatulence or burp. Apparently the microbes in my guts that help me digest meat and fats don’t get flatulence or burp either. There is a slight humming sensation in my hands, when I need to eat something I get a little bit antsy. If I overdo fasting sessions between meals I get hungry sensations but they aren’t like the cravings you get when you are eating carb meals. Those cravings are more like the ones you get when you need a cigarette. You know you don’t really need to eat anything because you just ate an hour ago, but you are ‘hungry’. I don’t get any of that. I also can be around carbs when I am in ketosis and get no desire to eat ‘just one’, which is way different than when I am eating carbs. Another feature of ketosis is that I can immediately tell if something I eat contains carbohydrate. Yesterday I ate a can of smoked oysters between lunch and coming home. I eat lunch at 11:30 and don’t get home until 6:30 PM, which means dinner is at around 7:30, eight hours after lunch. If lunch is only a half pound of breakfast sausage then I need something to tide me over energy-wise for that long. Yesterday it was oysters, and it never occurred to me to check the label on what I assumed was seafood in a can. As soon as I was done eating them my heart began to pound a little bit, a sign of eating carbs. Having already thrown the box away I couldn’t check, and I didn’t suspect. I thought maybe I was starving myself a little too hard, even though the foods I am eating contain sufficient calories to keep me from starving. I have miscalculated calories before, as I documented in the “21 Day Sugar Detox Journal”, but I checked my foods in the “MyFitnessPal” app and I appeared to be good on calories. I couldn’t figure out why I was feeling poorly. Last night I went to the grocery to stock up on canned meats and I checked the label of the smoked oysters I had eaten and lo and behold, there are nine grams of carbs in a can of oysters. What! That is two teaspoons of sugar, no wonder I had my sugar reaction, so I wasn’t starving, I was carb’ing. They were not enough carbs to knock me out of ketosis (I checked) but they were enough to give me premature hunger pangs and to make me feel like I had a shot of adrenaline. Weird, right? So today I feel much better, back on the ketosis wagon. Today we are going to be having pizza at work, and I put money in the pot. When I get my slices I will just eat the toppings, no breads. If there are carbs in the sauce I will be eating a small amount of that, because it can’t be helped. I am going to go ahead and eat pizza because the men that I work with will see that I am not living this weird monk-like existence subjecting myself to enforced isolation from a ‘normal’ diet. When they see that just eating meats does not cause any debilitating illness, does not cause any distress, doesn’t make me seem too different, they may follow my example to turn around their age-related weight gain. That is one of my hopes. Tonight we are having guests and serving spaghetti squash and home made meatballs. I will serve myself like everyone else and just eat the meatballs in sauce. I will have about twelve ounces of them, so that I am sure to get enough fat and protein to meet my needs. I won’t make a fuss about it, I want my guests to feel comfortable and to never question my comfort with dinner. If anyone asks me about it I will share what I am doing and thinking like the good evangelist that I am. For now I can tell you, after a whole three days without eating anything but meat that I don’t feel any ill effects at all. I have not weighed myself since day one, and if I have lost any weight is from the process of my body chemistry changing to the process of using ketones for energy over glucose. Losing weight through ketosis is a slow steady thing, and would continue until I hit my natural weight and no more. So far what I have read is true; eating just meat and fats has really pretty much stopped any hunger pains of starvation, and put an end to carb food cravings. The carb food cravings might be worse for some people than others, though, so your mileage may vary. This entry was posted in Health, Living and tagged atkins diet, carbohydrates, high fat, ketone bodies, ketosis, low carbohydrate, meat eater, smoked oysters. Bookmark the permalink. Another benefit of ketosis–cancer cells cannot use it for energy–they must have glucose to power their mitochondria. I read that! There are some cancers that aren’t like that, but most are. You would think that knowledge would be out there.